“They” obviously aren’t rock fans. In rock ‘n’ roll circles imitation generally isn’t looked upon very kindly by audiences who tend to have a very possessive view of their favorite artists. While nobody begrudges those who are influenced by an originator, molding certain elements of that artist’s approach into something different and new – and in fact succeeding with that usually elevates the stature of the earlier act, confirming their greatness in a way and ensuring their impact will be longer lasting – the same is not true for the imitators. Those who merely attempt to copy the originators without deviating from the sound at all are met with outright scorn at times. The perception of course is that the imitators are not talented enough to succeed with their OWN style and thus attempt to almost deceive the public into thinking that their record at first listen might in fact be the product of the bigger more established and respected name. Subterfuge… carbon-copy… rip-off. All of these terms certainly apply in these cases and while an artist might get a minor hit out of deluding the masses with just such an attempt the first time out it usually doesn’t make for a very long and rewarding career if you’re seen as merely a pale imitation of an original. When that original artists evolves, what do you do, follow the exact same path? It doesn’t work, which is why the imitators generally are one-hit wonders (IF that) and nothing more. You just simply prefer hearing the real deal. Yet of course this doesn’t stop the record industry from trying to latch on to whatever new sound is making the most noise and rather than flex their creative muscles (assuming they have any to flex) it’s far easier to take somebody else’s blueprint and apply it to another artist and attempt to pass it off as somewhat original. Though I may come to regret this prediction in the future, I’m pretty sure there’s not going to be many examples of this practice whose scores even reach average (5) throughout rock history. In fact, I’ll go so far as to say the entire oeuvre of artists who attempt to steal blindly from a major star won’t EVER be at risk for having even one later effort be well above average and allow them to carve out their OWN distinct niche in music, well out of the shadow of the act they started off by imitating. Here, of course, is the exception that proves the rule. We’ve already met Little Willie Littlefield, teenage piano prodigy whose skills on the keys were evident on the storming instrumental Little Willie’s Boogie. The flip side to that showcased his tentative vocals which while certainly a little rough around the edges, had a warm and pleading tone which made the results fairly effective and marked him as a potential dual threat going forward. One might even envision him – considering his instrument of choice and the fact he was originally from Texas – as a challenger to the reigning king of rock piano Amos Milburn who was also from Texas. In fact, at a few points on My Best Wishes he even sounded faintly like Milburn the way he held certain notes with a yearning quality that was quite disarming no matter WHO was doing it. Apparently the folks at Eddie’s Records label thought so too because now they seemed to be dispensing with any thought of letting Littlefield, still just 17 years old, find his own voice and instead were crassly attempting to position him as Milburn Jr., offering him up as a facsimile of someone who was now the biggest star in rock. The question is when they decided on this course of action. I don’t have the recording dates for this but it would appear the six sides he cut for the local start-up label were done at the same date which would place them just before Milburn’s national breakthrough and thus they might NOT have been intentionally capitalizing on the success of something like Bewildered which was now riding atop the charts. But that doesn’t mean the obvious debt to Milburn’s vocal approach was completely accidental either. While the two had a similar smoky low tenor voice and barely perceptible lazy Texas drawl, it’s Littlefield’s phrasing which connects him to Amos as much as their shared natural qualities and THAT surely was intentional. It’s not as if Milburn was an unknown prior to the time his runaway hit Chicken Shack Boogie was released this past fall. Milburn had a long résumé of solid records with decent commercial returns, especially one would imagine around his home territory of Houston where Littlefield was also from. It’s only natural that he’d imitate the one notable success from his own backyard, if only to see if the teenage Willie could envision himself in such a position himself someday. So when asked to lay down a few vocal numbers in addition to the instrumental workouts he excelled at, of course he’d be prone to show off his best Milburn inspired effort. But that’s not how it’s going to be received by the public, who even at this early stage of the game knew a bandwagon being jumped on when they saw it rolling through the streets. 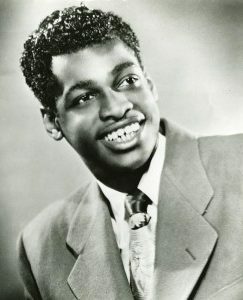 Whether intentional or incidental the fact that Boogie Woogie Playgirl sounds SO much like Amos Milburn, currently the hottest ticket in all of rock with two #1 hits the past month alone, meant that, fairly or not, Little Willie Littlefield was going to be viewed as an imitation and nothing more. All of which makes his subsequent emergence as a unique and original performer in his own right all the more remarkable, but which also makes reviewing THIS record, where he’s anything BUT unique and original, a bit more difficult. Let’s start off with what’s bound to jump out at anybody with even a passing notion of Amos Milburn’s recent catalog and that’s how startlingly close to Milburn’s voice Littlefield is. Not just the tone, which makes it sound as if they are twins, but also the mannerisms which should serve as the prototype for anyone going into the field of impressionism. As aspiring Rich Littles, Dana Carveys or Will Ferrells know, the key to nailing an impression is finding a hook to return to, a vocal tick of some sort that ties the whole thing together and which you can then build off of because that one trait will form the connection the audience needs to believe in the rest of the performance. Here that’s Littlefield’s uncanny ability to draw out certain words with the same languid feel of Milburn that always makes Amos sound casual and in control of every emotion. It’s always more evident on the slower numbers, and while the title alone of Boogie Woogie Playgirl suggests something uptempo and off-color this is a trademarked Milburn-esque ballad, a crawling emotional lament of the highest order. The way Little Willie offers up the word “feel”, adding about a half dozen e’s to the middle of the word, makes you do a double take and check the name on the label to make sure it’s not really Milburn. The effect is uncanny, the two could switch places and you wouldn’t be able to tell the difference at times, which of course was surely the intent. A record store owner who now was running a label as Eddie Henry was certainly knew what records sold best and Milburn’s were flying off the shelf, so the closer you can sound to him the better. It helps that Littlefield has equal command as a pianist with which to fall back on to bolster the connect that way as well. Milburn was arguably the best – certainly the most identifiable – rock artist on the keys to date but Littlefield was shaping up to be just as good. Though that type of acclaim is usually reserved for the more flamboyant sides where he runs through his arsenal of quick-fingered runs and pounding boogies, it’s just as evident on the ballads where both Milburn and Littlefield have to be more judicious with their playing, shading the song in an appropriate manner without drawing undue attention to their intent. Willie succeeds in that regard too and is aided immeasurably by saxophonist Don Wilkerson another teen prodigy from Houston who, while certainly no Maxwell Davis in terms of experience or acclaim, would make a name for himself as a highly skilled sideman, including for none other than Milburn down the road. Though the fidelity is not up to the standards of the Davis produced sides on Amos, the sound quality certainly isn’t bad and the overall feel of the record is very professional and classy. So if you’re inclined to just think of this as an Amos Milburn pastiche, something you might not regard with much respect in terms of creativity but at least are willing to judge it on how well it mimics its sources, you’d have to admit that it succeeds in that sense beyond any reasonable expectations. You conceivably COULD slot this in with Milburn’s output at the time and it wouldn’t stand out as being inappropriate or ill-fitting in any way. In fact unless you were a devoted fan, historical researcher or particularly sharp-eared listener you may not even be able to pick this out as being somebody not named Amos Milburn to begin with! But that of course is its flaw too. Little Willie Littlefield wasn’t going to make a name for himself if he was busy living off the name, reputation and fan-base of somebody else. He’s still clearly good enough to make it seem less opportunistic in a way, you’re not quite outraged at the act as much as you are mildly intrigued by his appropriation of another’s style. You can tell he’s got the skills required to be more than just a pale imitator, but at this stage you’re left wondering if he’s got the ambition required to set his own course, or if he’s got a record label more interested in cultivating an original artist rather than content to take the table scraps from an already established one. Since I’ve already given away the answer to that by saying how Littlefield is the exception to the rule, the one cat who would make a name for himself based on his own musical vision, we may be able to look at this deviation from that goal a bit differently than if it WAS January 1949 when this had all the makings of a crass exploitation. Yet even as crass exploitations go this one is better than it has any right to be. It’s far closer to the quality of Milburn’s earlier work than a mere blatant hack job ever could dream of being. Whether that’s worth spending your 79 cents on Littlefield’s record as opposed to whatever Milburn record you still needed for your collection is another question entirely and if you have only a buck in your pocket you’re still better off going with the original at this point. Little Willie Littlefield may have begun as an imitator of somebody else but quickly became an originator in his own right which is why we can look back at Boogie Woogie Playgirl with a sense of relief that it didn’t find a bigger and more receptive audience, even finding time to admire what he was able to adapt from Milburn and refine to fit his own vision down the road while shedding the more obvious traits that were only going to stifle his own persona and prevent it from emerging. The lesson as always is it’s far better to be who you are and not attempt to live off someone else’s glories. Still, if you’re inclined to try it once, this is about the best you could reasonably hope for. Good enough for him at the time. Just good enough for us now to modestly recommend. But not quite good enough for lasting acclaim. If he wanted that he’d have to leave Amos Milburn records to Amos Milburn himself and give us Little Willie Littlefield records from this point forward. 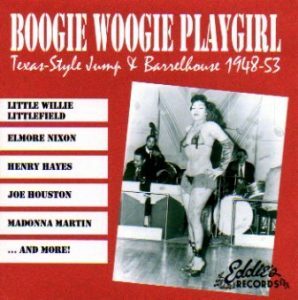 Leave a reply on "Little Willie Littlefield: “Boogie Woogie Playgirl”"